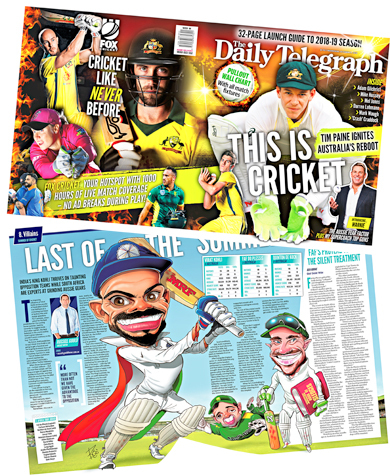 News Corp has turned to print with a 32-page supplement to its Australian metro tabloids to launch its Fox Cricket pay-TV channel. The supplement appears as a wraparound to News' Sydney, Melbourne, Brisbane and Adelaide dailies (the Daily Telegraph, Herald Sun, Courier-Mail and The Advertiser). The Foxtel cricket launch comes as News is expanding its free-to-air reach today with a second FTA channel, Your Money - in partnership with soon-to-be Fairfax owner Nine Entertainment - following its earlier introduction of a Sky News on WIN digital channel. News Corp managing director of sales Lou Barrett says the launch marks "the start of us redefining cricket in Australia" and follows News gaining rights from Cricket Australia. The News Corp metros are also looking to reignite debate over whether Steve Smith and Dave Warner should be reinstated with a concerted poll and an article by chief cricket writer Robert Craddock.